Our Heat Transfer Tests allow you to experience an online examination in the real-time environment. In every online test on Heat Transfer, you will be presented with Multiple Choice Questions (MCQs) which will test your skills in Heat Transfer Concepts in a detailed and comprehensive manner. In the test, each question will have 4 options to choose from. You should select only 1 correct option as an answer and then move on to the next question. Once you submit answers to all the questions, you will be given your final test score. In the Online Heat Transfer Test, for every correct answer, you will be given 2 points. There will also be negative marking of -1 for every wrong answer. So, you will have to be more careful in choosing the answers to the question in your online examination. If needed, you should skip to the next question and come back to the previous question later so that you can do proper time management for the online mock tests. 1. 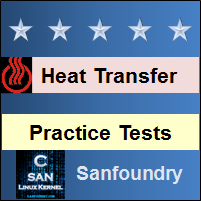 "Heat Transfer Practice Tests" - In Heat Transfer practice tests, there will be a series of practice tests wherein you can test your Heat Transfer concepts on every chapter separately. There will not be any time limit on these tests. So, Heat Transfer Practice Tests should be the first set of tests which you should attempt. Goto these practice tests here. 2. "Heat Transfer Mock Tests" - In Heat Transfer mock tests, there will be a series of mock tests wherein you can test your Heat Transfer concepts on every chapter separately, but there will be a fixed time limit per test. So, it is similar to Heat Transfer Practice Tests, but with an added constraint of time limits. 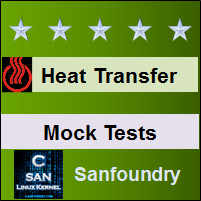 You should try Heat Transfer Mock Tests if you are appearing for any online examination soon. Goto these mock tests here. 3. 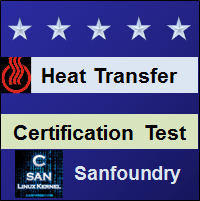 "Heat Transfer Certification Test" - Once you are through with your Heat Transfer concepts, then you should try our Heat Transfer Certification Test wherein Sanfoundry will issue a free Certificate to you if you scored either Grade A* or Grade A in Heat Transfer Certification Test. Goto Heat Transfer Certification test here. 4. "Heat Transfer Internship Test" - If you are interested to do Internships in Heat Transfer at Sanfoundry, then you must take our Heat Transfer Internship Test. If you scored either Grade A* or Grade A in Heat Transfer Internship Test, then you are eligible for Internship at Sanfoundry in Heat Transfer. Goto Heat Transfer Internship test here. 5. "Heat Transfer Job Test" - If you are a fresher, a dropout, an experienced person and if you know Heat Transfer well and looking out for jobs in Heat Transfer domain at Sanfoundry (or our Network of Companies), then you should try and qualify our "Heat Transfer Job Test". 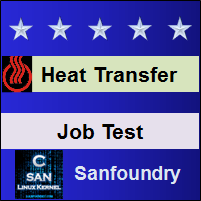 If you scored either Grade A* or Grade A in Heat Transfer Job Test, then you are eligible for a Job at Sanfoundry (or our Network) in Heat Transfer domain. Goto Heat Transfer Job test here. For every "Heat Transfer Practice Test", Total Questions: 20, Total Time: Unlimited. For every "Heat Transfer Mock Test", Total Questions: 20, Total Time: 20 Minutes. For "Heat Transfer Certification Test", Total Questions: 50, Total Time: 1 hour. For "Heat Transfer Internship Test", Total Questions: 50, Total Time: 1 hour. For "Heat Transfer Job Test", Total Questions: 50, Total Time: 1 hour. Before you get started on these series of online tests on Heat Transfer, you should learn, study and practice our collection of 1000 MCQs (Multiple Choice Questions and Answers) on Heat Transfer here. We also prefer that you should practice Heat Transfer practice tests and mock tests completely before attempting the certification test. Here is the list of online practice tests and mock tests on Heat Transfer. Each online test focuses on a "Specific chapter of Heat Transfer". So, you should try both practice test and mock test on every chapter to do a self-assessment of your knowledge (along with time-limit constraints) in every area or sub-topic of Heat Transfer. Heat Transfer Certification test, Internship test, and Job Test are mentioned at the end of this list. 1. Heat Transfer Test 1 – This set of online test on “Heat Transfer” tests your skills on Modes of Heat Transfer, Steady and Unsteady Heat Transfer, Fourier Equation, Thermal Conductivity of Materials, General Heat Conduction Equation, Conduction Through a Plane Wall, Conduction Through a Composite Wall, Conduction Through a Cylindrical Wall, Conduction Through a Sphere. 2. Heat Transfer Test 2 – This set of online test on “Heat Transfer” tests your skills on Shape Factor, Effect of Variable Conductivity, Critical Thickness of Insulation, Heat Generation Through Plane Wall, Dielectric Heating, Heat Generation Through Cylinder, Heat Generation Through Sphere, Fins, Steady Flow of Heat Along a Rod. 3. Heat Transfer Test 3 – This set of online test on “Heat Transfer” tests your skills on Heat Dissipation from an Infinitely Long Fin, Heat Dissipation from a Fin Insulated at the Tip, Fin Performance, Design Considerations for Fins, Heat Flow Through Triangular and Parabolic Fins, Thermometric Well, Time Constant, Response of a Thermocouple. 4. Heat Transfer Test 4 – This set of online test on “Heat Transfer” tests your skills on Transient Heat Conduction Solids with Infinite Thermal Conductivity, Transient Heat Conduction in Solids with Finite Conduction, Biot Number, Lump System Analysis, Transient Heat Conduction in Infinite Thick Solids, Periodic Variation, Transmissivity, Reflectivity, Absorptivity, Black Body. 5. Heat Transfer Test 5 – This set of online test on “Heat Transfer” tests your skills on Spectral and Spatial Energy Distribution, Planck's Law, Stefan- Boltzman Law, Wein's Displacement Law, Kirchoff's Law, Gray Body and Selective Emitters, Intensity of Radiations, Solar Radiations, Heat Exchange Between Black Bodies. 6. Heat Transfer Test 6 – This set of online test on “Heat Transfer” tests your skills on Heat Exchange Between Non Black Bodies, Electrical Network Approach for Radiation Heat Exchange, Radiations Shields, Adiabatic and Reradiating Surfaces, Gaseous Radiations, Types of Flow, Reynolds Number. 7. Heat Transfer Test 7 – This set of online test on “Heat Transfer” tests your skills on Types of Convection, Nusselt Number, Newton- Rikhman Law, System of dimensions, Dimensional Homogeneity, Rayleigh's Method, Buckingham's Pi- Method, Model Studies and Similitude, Dimensional Analysis- Advantages and Limitations. 8. Heat Transfer Test 8 – This set of online test on “Heat Transfer” tests your skills on Significance of Dimensionless Groups, Correlations for Forced Convection, Laminar Flow, Turbulent Flow, Boiling, Bubble Growth, Nucleate Boiling, Free Convection Boiling, Condensation. 9. Heat Transfer Test 9 – This set of online test on “Heat Transfer” tests your skills on Thermal Boundary Layer, Pohlhausen Equation, Fouling Factor, Classification of Heat Exchanger, Mean Value of Capacity Ratio, Mean Temperature Difference, Symbols of Geometrical and Thermo Physical Properties, Reynolds Analogy, Laminar Film Condensation. 10. Heat Transfer Test 10 – This set of online test on “Heat Transfer” tests your skills on Specific Heat, Turbulent Film Condensation, Heat Transfer Coefficient, Heat Flux Through a Cylindrical Wall and Plate, Hydrodynamic Boundary Layer, Thermal Conductivity of Different Materials, Solar Absorptivity, Von- Karmal Equation, Heat Exchanger Effectiveness, Number of Transfer Units. 11. Heat Transfer Certification Test - This set of online free certification test on "Heat Transfer" tests your skills on all areas (all chapters, topics and subtopics) of Heat Transfer. 12. 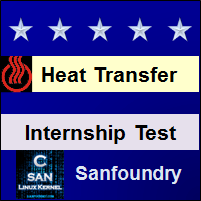 Heat Transfer Internship Test - If you scored either Grade A* or Grade A in our Heat Transfer Internship Test, then you can apply for Internship at Sanfoundry in Heat Transfer. 13. 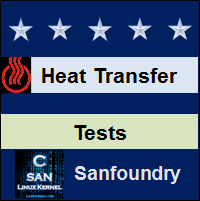 Heat Transfer Job Test - If you scored either Grade A* or Grade A in our Heat Transfer Job Test, then you can apply for Jobs at Sanfoundry in Heat Transfer domain. Best Wishes for your Heat Transfer Tests!